A GOLF + HOTEL PACKAGE? YOU CAN CHAT WITH US? WE ALSO BOOK MESQUITE GOLF COURSES! St. George, Utah golf courses have become a serious “must play” experience among popular golf destinations around the country. Dazzling red-rock cliffs, coral-pink colored sand dunes and rugged black lava rock provide frames for manicured fairways amidst the often unreal looking desert landscape. St. George golf has been so well liked that a recent GolfDigest Readers Poll landed St. George as a “Top 20 Buddies Trip Destination”. So you’re looking for local knowledge about where to stay, what St George Golf Courses to play, where to eat and maybe a even get a few local secrets? Sweet! It’s what we have been doing for over 12 years! We know exactly how to help you, and how to best schedule St. George Golf Packages with years of professional experience. You guys are awesome, and St. George is simply amazing! GET A ST GEORGE GOLF PACKAGE QUOTE HERE - OUR CUSTOMERS LOVE OUR HELP! Our staff are experienced golfers and savvy travel professionals who know exactly how to help golf vacationers create a perfect golf getaway. With this website and our simple quotes and easy booking system, we’ll help you create and book a St. George Golf Package quickly and conveniently. 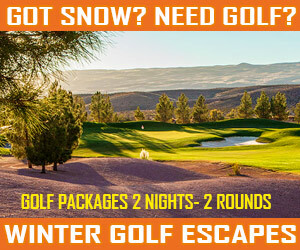 We have the experience, confidence and insight to make your St. George golf vacation easy and truly unforgettable. StGeorgeUtahgolf.com is operated by GolfPackagePros, a talented team of well-traveled golfers, including award-winning golf course photographer Brian Oar, veteran golf travel writers, and an established golf packaging company. Our staff has been booking St. George, Utah 10 years and helping guests like you enjoy memorable golf vacations in the western United States. We also offer Mesquite Golf Packages just 30 minutes to the south, Las Vegas Golf Packages only 90 minutes south of St. George, Utah! Give us a call at 800-407-7723 if you need help in those areas as well. So,…do you still need yet another reason to book with us…umm okay? StGeorgeUtahGolf.com uses https 256-bit SSL site-wide security by GoDaddy to securly lockdown our entire website, payments and information! See our GREEN PADLOCK in the address bar? Safe and secure!